[Lipglosseater]: Attention: All The Body Shop Malaysia Fans!!! O.O I wonder how far the price will reduced to...thanks for the info! You surely get the news fast. only yest i was at the Body Shop in KLCC and the SA told me there'll be some promotion coming up but she said she doesn't know what kind of promotion. I kinda suspected their annual sale already. ;) YAY!!! hitting TBS this coming Friday and lots of other things to do in KLCC this Friday! Connie: good for you!! $$$ saved then!! hahaha!! I think the TBS SAs need to have more complaints made to their superior, like what I did to the BB part-timer! The SAs at TBS KLCC especially are the most horrible lot I have ever seen! Followed no.2 worst by TBS Midvalley! I like the SAs at TBS Pavilion KL. Very young girls, very friendly and helpful, and always help me to watch over my little girl and entertain her while I looked at stuff in their shop. mmm......let's see.....should i skip this round of sale?? :P been buying too much.... and waiting for the Hot Brights collection. and talking of the Hot Brights collection, I asked that horrible TBS SA, and she so 'lan si' told me "aiyoh....our current promotion not yet finish, next month got another(i think she meant the sale but didn't want to tell me,) wait la...cannot wait ah?" waa...talking of this, feel like writing another rant post in my blog and called TBS to complain. I kept quiet when she said like that cos I saw she was pregnant. I normally just take it easy on pregnant SAs, but then.... I am a paying customer, why should i tolerate such nonsense yea?? 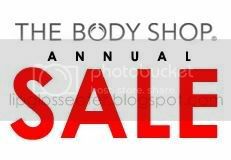 discount 70% for all bodyshop stuff or selected one?? i have so many things in list now. hahaha how bout the makeup?? perfume?? n spent rm135 wen i initially ONLY wanted to buy the serum..*cries silently in my heart*..y is it dat i cudnt resist?? I dont see the especials on the website. I got a limited edition blusher at 50% off and lip+check stain at 10%..
icic... wow!! 50% off for a blush is really a good deal!